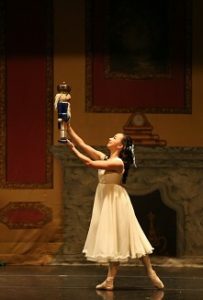 Gregory Hancock Dance Theatre presents The Nutcracker at Pike Performing Arts Center, December 1-2, 2017. This full-length modern version of the holiday classic features the highly talented dancers of G2, the pre-professional company of GHDT. G2 is joined by students from The Academy of Gregory Hancock Dance Theatre and other young student dancers, to fill the stage with movement and color. The Nutcracker follows the same overall story line as the original, but with a unique twist. This magical updated version portrays Klara as a homeless orphan girl who discovers the true meaning of the season through the gift and giving spirit of a homeless man. The Nutcracker is sure to add joy and cheer to your holiday season.